Signed Impressionist Painting of a Market Scene from Ghana, "Market in Colors"
Informed by pointillism, this impressionist painting from Ghana features careful dabs of the paintbrush that suggest shape and form. 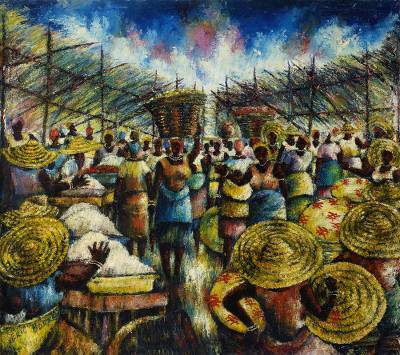 Eric Oko Borketey paints a market scene during the day, capturing the salespeople and shoppers that carry baskets of goods atop their heads. This amazing painting incorporates a variety of colors as the artist explores its vibrant nature.